Cutting the coil formers just now, the piece PCBs are done and I’ve just had a message from ‘Border Force’ to say they have a parcel and want me to delight them by filling in forms. As they haven’t even managed to get my name right as yet it may take some time to persuade them to part with a large box full of nixies from ex Soviet Russia that are obviously dangerous…. 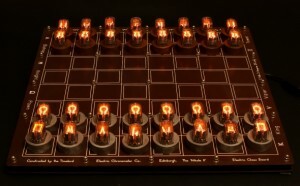 Chessboard V1.5 On Sale At ThinkGeek.com! A plastic spoon can be dangerous in the wrong hands. Does this mean you’ll start shipping at the beginning of September? Customs just want an invoice from the seller describing exactly what is in the parcel and the total cost including postage – yes I have to pay tax on the shipping cost as well. This was already on the package but not in English. Assuming no more problems they should be here by the end of next week. Trying to reach you with a media request. Can you shoot me an email or tell me where to find your address? Thanks!